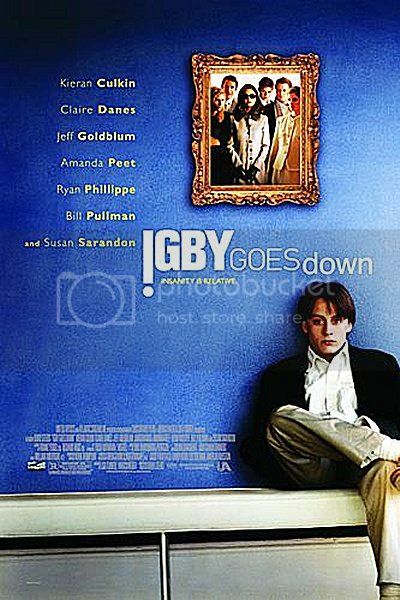 Igby Goes Down fancies itself a Catcher in the Rye -style exposé of old money immorality. It centers around the coming of age of young Igby (Kieran Culkin), a 16-year-old trustafarian misfit who can't seem to not flunk out of his prestigious northeast prep schools. Like Salinger's Holden Caulfield, Igby flits in and out of New York's glittering squalor - drug dens of failed artists, mansion parties at the Hamptons - doing designer narcotics, slumming it in the Upper East Side and getting his heart broken again and again. Unfortunately, Igby is no Holden. Persecuted by bad memories surrounding his charismatic, schizophrenic father (an unexpected Bill Pullman) and his shrewish, pill-popping mother (Susan Sarandon), he can find no comfort in the world - and so he's angry, a rebel without a cause. He falls for the lower class (which, in this story's hierarchy, means upper middle class) Sookie (Claire Danes), he works for the slimy, powerful D.H. (Jeff Goldblum), and he angsts at his older, successful brother, Ollie (Ryan Philippe). The moral of the story seems to be that people are evil and money makes them eviler. And this is presented as a satire. It doesn't really work. The central misanthropy is naive, cliche and unrealistic (military school beatings are one (albeit tired) thing, but lacrosse girls pummeling themselves in Central Park? when does this even happen?). The writing is full of affectations and name-dropping - see how smart and well-read these characters are! See how intellectual and bourgeois! Yes, yes, yes. We get it. But we aren't really impressed, and we certainly don't care - mostly because the tone is so uneven. How can we be angry or sad when everything is painted like a dark comedy? The rare sad bits - a flashback to the father's breakdown - are jarring. The funny bits - usually, revelations of how a character is a hypocritical reptile - are tiresome. This is a shame, since Kieran Culkin, Jeff Goldblum, Susan Sarandon and (again, unexpectedly!) Bill Pullman can be really charismatic. Ryan Philippe puts in a strong performance and Claire Danes we've loved since My So-Called Life. Some of the song selections were fun flashbacks to 2002 indiedom. But the writing was just too blah, trying to make up for a lack of depth by inserting stereotypical dysfunctions. For better "coming of age in New York City" stories, see A Guide to Recognizing Your Saints and The Squid and the Whale.